On 14 February 1991, precisely one hundred and fifty years after the arrival of Angus McMillan's party of five at Port Albert, the citizens of the Shire of Alberton celebrated the birth of Gippsland. Over eight hundred children from ten schools in the district, many of them in period costume, gathered for a day of activities highlighted by the unveiling of a commem-orative plaque by the Governor of Victoria Dr. Davis McCaughey. Young Kunai men from Morwell under the direction of Albert Mullet entranced youngsters with their traditional dance, many joining in with crouched posture as they imitated the Emu or enacted the hunt. There was no mistaking Angus McMillan; the red tartan cap forming a bridge over his bushy white whiskers announced a proud ancestry. The ride had been hard, over unexplored hills covered with dense bush, tall timbers and deep ferny glades. Beads of glistening sweat dripped from the horses, as anxious as their riders to have reached the southern coastline. A shrill cheer rose from the young crowd as a longboat appeared from behind the mangroves, rowed with the vigour of those a century and a half before. The British flag was raised and a shattering 'one gun' salute fired before passing around the obligatory cask of rum. With the celebrations over, Port Albert retired back to its sleepy ways. As an operational fishing port for the waters of Corner Inlet and Bass Strait, there is always some activity but generally it remains quietly reflecting on the days when it was the main port for central Gippsland, a vital link for the people and produce of the rich inland hills. At the entrance to the main channel, the boilers of the paddle steamer Clonmel may still be seen at low tide. She too had a significant role in the settlement of eastern Victoria. The 600-ton steamer left Sydney on 30th December 1840 on her second voyage to Port Phillip under command of Captain Tollervey. At around 3.00am on 2 January 1841, the Clonmel grounded on a sandbank south of the present Port Albert. After an anxious night, all passengers and crew were safely landed on the narrow island that now bears the name of the ship. When finally the passengers and crew arrived at Port Phillip they told of the fertile narrow plain extending beyond the inlet toward northern hills. Encouraged by this report, and that of Count Strzelecki who had arrived in Melbourne on 19 May 1840 after crossing Gippsland from east to west, eight men formed the Gippsland Company to charter the 343-ton barque Singapore, Captain Hamilton. As they were leaving Melbourne on 6 February 1841, Angus McMillan was less than a week from arriving at the eastern end of Corner Inlet. Neither party knew of the existence of the other. Had the Singapore sailed directly to the site of the wrecked Clonmel, the two groups may well have met. But the Gippsland Company lost several weeks in exploring the shallow waters of Corner Inlet, finding no suitable channel to enter. With expenses mounting and nothing to show for their efforts, Captain Hamilton sailed for the wreck of the Clonmel where they immediately noted a deep channel stretching inland. On March 9 the party landed nine horses and provisions, naming the site Port Albert. A two-roomed cottage was erected as other members of the group under W.A.Brodribb headed north to explore the province, still unaware of McMillan's journey. They named the LaTrobe River and Lake Wellington, and commented on the magnific-ent fern valleys that now make up the Tarra-Bulga National Park north of Yarram. Had Brodribb and the other members of the Company been more observant they may have noticed the tall gum tree with the words ANGUS McMILLAN 14-2-1841 sliced into its trunk. McMillan had already been and gone. As overseer for land-owner Lachlan Macalister, McMillan penetrated deep into Victoria's south-east mountains, convinced that a track could be made to the sea. The determined immigrant epitomised the tough, determined settler that established the great Australian pastoral industry last century. Refusing to abandon the rugged country, McMillan defied the authority of his boss and made a confident march south from Ensay (between Omeo and Bairnsdale) to reach Corner Inlet north east of Wilsons Promontory where he 'supped the salt water in his Highland bonnet'. Thus he became the first man to traverse the magnificent Gippsland ranges and has arguable claim, along with Count Strzelecki and Captain Tollervey, as being the founder of Gippsland. McMillan returned to Ensay and immediately arranged for a bullock team to assist in cutting a track down to Port Albert. Imagine his surprise when he arrived back at the mouth of the Albert River to find a cottage and a small company of men in tents where last he saw only blacks and kangaroos. Within months of the arrival of the Singapore, Port Albert was a hive of activity; huts and tents strewn along the narrow beach with over a hundred settlers planning their next move inland. McMillan was delighted that his expectations of a safe harbour had been proved. Cattle could now be driven south to Port Albert for dispatch to Melbourne and Sydney. The opening up of new pastoral lands resulted in the steady growth of Port Albert. The town thrived during the 1850s and 1860s as the major port for cattle and gold servicing eastern Victoria. The Bank of Victoria opened in 1856 when gold was discovered in Walhalla. Port Albert became the major gateway to east and central Gippsland between 1841 and 1878, exporting cattle to New Zealand and Tasmania and providing the passage into Gippsland for goods and people from Melbourne and overseas. The opening of overland routes and the steamship trade to East Gippsland resulted in the decline of Port Albert's shipping trade which finally ceased in 1920. By 1879 the railway from Melbourne had reached Sale. The port had served its purpose. Port Albert is still one of the few active commercial fishing ports in Victoria, with half a dozen boats operating in eastern Bass Strait. With the development of the port, and the clearing of land for pasture, other towns grew in the region from a few shacks to thriving communities with the ubiquitous pubs. Very little now remains of Tarraville which had its peak during the 1850s and 1860s when five hotels were kept busy, and Mother Buntine, a female bullock driver would pass through on her way to the Walhalla goldfields. The township of Alberton, from which the old shire took its name, was proclaimed in 1842. A brewery was opened in 1847 and the beautiful old Victoria Hotel still serves its customers, although without the elegance of its old cast-iron lace verandah. Alberton is now only a shadow of its former prosperity, being mainly residential. The Shire of Alberton was proclaimed on the 2 February, 1864. The Shire of South Gippsland was formed from part of the original Alberton Shire later in 1894. The area covered by the old Shire of Alberton is 1,851 square kilometres which extends from the Strzelecki Ranges in the north, to the coast in the south. it is not unreasonable to suggest that this is roughly the area now serviced by the Yarram and District Health Service. The Wellington Shire Council was formed in December 1994 as part of the Victorian Local Government Board's review of the Gippsland area. The new municipality now comprises the former Shires of Alberton, Maffra, Avon, the former City of Sale and sections of the Shire of Rosedale. The administrative centre is in Sale, seventy kilometres from Yarram. During the mid-19th century, an elephant was brought to Alberton by Edward Martin. This recently found photograph is believed to indeed be of that pacyderme. According to Kenneth Cox in his excellent history Land of the Pelican, and John Adams in his equally informative From These Beginnings, the elephant was enjoying, presumably, a leisurely sea cruise from Hobart when the vessel called in to Port Albert and anchored off, it is thought, Kate Kearney entrance. Here it was landed, probably by swimming it ashore. The elephant had been bought from a 'Ceylon syndicate of sailors' in Hobart by Edward Martin of Alberton. Local folklore has it as a once circus animal but if it were owned by a Ceylonese sailors, it was probably brought to Australia from Ceylon to sell. Local folklore also has the 'circus animal' heading from Hobart to Sydney to be sold. 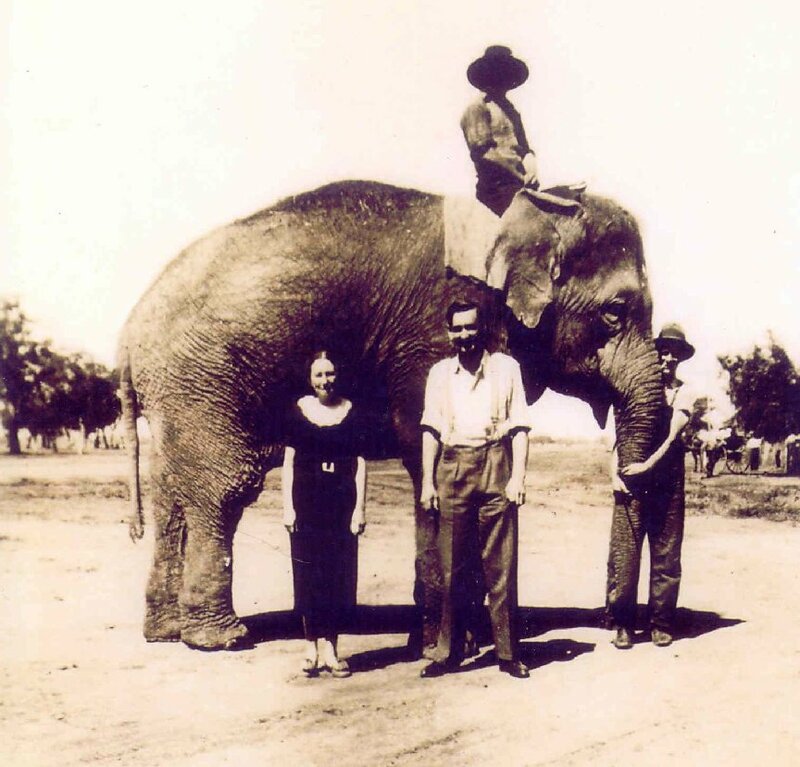 Be that as it may, Edward Martin bought and brought the elephant to Alberton to work on his property, much to the utter astonishment of the early settlers and of frightening bewilderment to the local aborigine population. Edward's belief was that the elephant would be an ideal ‘draught horse' to plow his land. Instead it frightened the cattle, drove off the aborigines, and proved impractical on the land. No doubt the elephant came to the same conclussion and wandered off one cold night into the bush and disappeared. Its carcass was later found on the Martin property, a sad end to a magnifient animal. Research has not, so far, revealed any specific date on the elephant's arrival at Alberton. Edward Martin lived at ‘Fen Farm' on the road to West Alberton - when, is not certain but the property was later owned by a Mr G. Scott. Edward Martin died in 1883. We are probably looking at a period from 1850 to 1870. The photograph shows what appears to be a man of dark colouring sitting atop the elephant. Edward and his brother Jacob were know to have dressed their aborigine labour in western clothes made of striped bed-ticking; this could be a local aborigine who had obviously overcome any apprehension toward the animal. Well, we hope so anyway. It begs the question of course - who are the four people in the photograph, and indeed was this photo taken at Alberton. The photo was recently presented by a well-established district family of several generations and thus has a measure of veracity that it was local. A quiz question: How can you determine whether it is an Asian elephant or an African elephant.? Any information on this period would be appreciated, especially verification of the photograph. You may like to contact David Gregory at the nursery in Commercial Road, or Peter Stone by email peter@oceans.com.au. AND WAS IT THE ELEPHANT? It has been generally agreed that this is NOT the Martin elephant. Yarram resident Kate Remfrey recalls that in the fifties and before, a circus would come to town quite regularly, and her father would enthusiastically collect elphant poo for the garden, it being especially high in nutrients so itt is said. She believes the photo if of a cIrcus elephant. The clothing seems to endorse that. Link on the photo for a larger image.